lizzy write: so, I had this date . . .
so, I had this date . . .
Last weekend I had a date with this really cute boy named William. 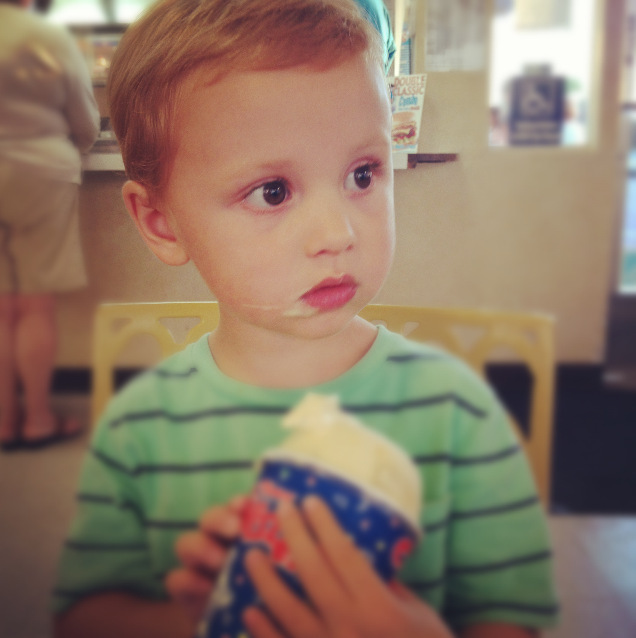 We went to get ice cream and even though I paid, he wasn't a great conversationalist, had terrible table manners and wouldn't stop talking about "Daddy" I still kissed him good night. I definitely think we'll be seeing each other again. It was a much needed date. After having a new baby in my life and a crazy summer with vacations and guests galore, our relationship was kind of struggling. Our date didn't last long and halfway through his treat he said, "We go see Daddy now" and walked to the car. Kind of sad but still, there are glimpses during the day when William looks at me and smiles his shy grin, or snuggles up in my lap and gazes at me while I hold him like a baby, that I know he still only has eyes for me. This just melted my heart. You'll get him back! The change in your relationship is just him growing up. Though it's nice he calls for Daddy. My dad had to work a lot when I was that young -- my whole world was my mother. I didn't get to know him better until I was in elementary school. (Which is not to slag my dad; I am so grateful that he worked so hard for us). LOVE this. LOVE Will-yum. LOVE you.